In a recent agile podcast, one of the hosts said that story points existed “just so that some manager can get a report.” That opinion might fly in a fantasy world where investments are made without any sense at all regarding what value might be provided, but that’s not how the real world of business works. Now of course, the pendulum can swing to either extreme. On one side, there is the belief that estimates aren’t necessary because they are simply an evil imposed by numbers-obsessed management, and on the other, people who take story points, divide them by the average velocity, and set hard-and-fast scope and timelines based on that math. AS with most things, the reality lies somewhere in between. We know that story points are a guess. All estimates are a guess. At the beginning, when we know the least about the problem we are solving, it needs to be understood that estimates will likely grow to deliver the scope, or the scope will need to be reduced to meet a timeline. However in a business, unless it is a pure research project, usually someone is putting themselves, or the organization’s reputation, on the line by sponsoring this. Multi-million dollar rollout plans may hinge on this work. As professionals, we need to set expectations. That doesn’t mean we should be cowed into sizing something we don’t understand, conveying a false sense of confidence over sizings, or providing low estimates to make someone happy in that moment. As an initial release plan is being formed, story mapping is done, and epics and some stories are identified, the team will identify risk and uncertainties. Those are used to convey the overall sense of confidence (i.e. “this is just like that thing we did last year – we got this” or “we haven’t solved this business problem before, and we’re using a new technology stack – we’re going to need some flexibility on scope or timing”). In addition to setting expectations, story points sizings help the team develop an understanding of what they are going to build. In backlog grooming/refinement, it is fascinating how a team can have a nice conversation about a user story and seem happy with its understanding of what needs to be done. Then there’s that moment when the Scrum Master asks them to size the story, and the conversation all of a sudden gets real and uncovers deeper information and concerns about the work involved, the requirements, risks, etc. Without this conversation, the story could have been included in a sprint, then morphed into a multi-sprint behemoth, the kind that just can’t seem to get to ‘done’. We owe it to the business to provide some sense of sizing. The business may need to be educated about what story points are and are not, and how sizings can change as our understanding changes. Use story points for good, not evil! As a technical person, it’s easy to jump to the solution before really understanding the problem. Instead, always strive to understand what user or customer wants and why they want it before deciding how to solve the problem. How is this put into practice? An easy way is via user stories that reflect what the user is trying to accomplish rather than a technical solution. It could be a business task the user is trying to accomplish or a business goal that they are trying to achieve. The beauty of agile is that you, as technical people, are not only empowered to ask these questions but are expected to. If anyone ever tries to tell you that you should not be concerned about the “what” or the “why”, do not accept that answer. Your users and customers will be much better off when you understand their needs. My first job as a Product Owner was at a company and industry that were new to me. I enthusiastically embarked upon learning the business, the (very large and complex) products, and getting to know the team and customers. After a few months, things seemed to be going pretty smoothly and my boss asked me to take responsibility as Product Owner on a second team. Challenge accepted! I took it as a sign that I was doing a good job and ready for more responsibility. Now I had two large (7 +/- 2 people) Scrum teams both dealing with unrelated parts of a complex product and implementing unrelated, complex customer needs. Was I learning as deeply about the product and the customers as when I only had one team? Maybe not, but I still felt that I was growing and delivering value. The mistake that I made was in accepting a third large team, also with a complex problem to solve, unrelated to the work the first two teams were doing. While it was fun to operate at such a fast pace, I started missing daily standups and retrospectives. Sometimes I had to focus on one customer for a few days at the expense of my other teams. In short, I stopped being a good Product Owner. Worse, I relied more on others around me for quick answers to questions about how the (existing, complex) product that we were enhancing worked rather than discovering that for myself thus stunting my learning process. The teams felt as though they were not getting what they needed from their Product Owner. The Product Owner’s level of domain expertise and level of existing product knowledge. The complexity of the customer’s needs or goals. Complex problems take time and collaboration to figure out. Whether the different teams are working in the same domain (or in the case of a very large problem domain, are they working on the same aspect/area of the same domain). Team sizes. Bigger teams usually mean more is completed in each sprint which means more work for the PO before and during sprints. The Product Owner’s level of expertise at being a Product Owner. If the ceremonies and nuances of working with a team and the customer are still somewhat unfamiliar to the PO, it will take them more time do fulfill basic PO responsibilities. There is no simple rule for determining how many teams a Product Owner can serve at the same time. Look at all of the factors above when deciding how much is too much. For a new Scrum Master, the mechanics of getting started with retrospectives are deceptively easy. Somebody tells them to write three columns on the whiteboard (What Went Well, What Did Not, Ideas) and to facilitate the discussion. The Scrum Master makes sure that management is not invited to the meeting. He/she Identifies the team members who are not participating and try to get them talking. Simple. The retrospective becomes a blend of problems mixed with solutions and “action items” for the next sprint. If the team is lucky, it identifies the most valuable areas for improvement. Unfortunately for many teams, they go through the motions but do not get to the heart of their biggest problems/opportunities. It becomes a stale ritual and the team plateaus. Surprisingly, many Scrum Masters fall short on the basics of how to conduct a retrospective. They think that all it takes is writing the three columns on the board. Properly done, it actually starts as soon as sprint planning is done. Lots of different techniques exist for each of the stages of a retrospective. The art is in the Scrum Master recognizing which one fits the team at that particular moment in time. To set the stage for the retrospective, the Scrum Master may remind the team that the retrospective is a safe environment. They could also do a check in where they go around the room and ask each person “How are you doing today?” to engage the team. Another technique is to ask people “if the team were a car, what kind/make/model of car were we in this sprint?” and record each person’s answer on the board. This can provide an interesting reference point to revisit if someone says the team was a Pinto but during the remainder of the retrospective does not point out any problems that occurred during the sprint. The sprint backlog and the results (done, not finished, etc) for each story. Impediments or challenges that occurred during the sprint. Laying them out on a calendar can help illustrate how they affected the sprint and generate conversation for how to handle them in the future (the Scrum Master may get in the habit of noting these as they happen). Is the team going through a storming phase? Asking team members to track how they were feeling about the sprint during specific stages of the sprint can help surface opportunities for working agreements, practices the team should adopt, etc. After trying to remember what happened over the last week or two (they know better than to do three or four week-long sprints) the team and Scrum Master may start to note some events as they happen to make data gathering easier in the retrospective. Was every story closed? If not, what state was each one in at the end of the sprint? Ask why. Then ask why again. Did the team stretch yet still meet the sprint goal? Reflecting on what the team did well could reinforce those practices and also set the stage for a discussion about how to take it to the next level. Is there a lot of discussion about whether the team should adopt certain practices? The insights could be focused on things the team to start doing, stop doing, and continue doing. Teams are usually pretty good at coming up with ideas for how to do things differently. Trying to do all of them at once or forgetting about them in the throes of the next sprint are common pitfalls. A good Scrum Master will gather these ideas as the team identifies them during the retrospective. A great Scrum Master will sense when the team has not really gotten to the heart of an issue or opportunity and prod them to drill down to the heart of the matter. Once the team has identified ideas or new practices to try in the next sprint, posting them near the Scrum board is an easy way to quickly remind the team about them when the team is gathered around the board during the daily standup. The remaining ideas go into the Insight Backlog. This backlog can be evaluated along with new ideas that come out of each retrospective to decide which ones to try next. (Old reliable) What Went Well, What Did Not, Improvements. Team members write ideas on sticky notes and put them in the respective columns. Dot voting for which ideas to adopt. Reviewing results for each story, conducting 5 whys for each one. Start Doing, Stop Doing, More Of. Again, sticky notes placed by team members can help with participation. Sailboat. What things are the wind in the team’s sails, propelling it? What are the anchors that are slowing it down? Another variation is Motorboat, where the team identifies the anchors that are slowing down the boat (team) and they can even place them a different ‘depths’ to indicate their severity. There are many ways to conduct a retrospective. The Scrum Master’s job is to find the right way to help the team improve at that particular moment in time. Overcomplicating the format of the retrospective can get in the way of improvement. Letting the format of the retrospective get stale can result in team members who have shut down from boredom before they even enter the room. The Product Owner should be there. They are a member of the team after all. In closing the retrospective, take time for Appreciations. Good people aren’t just working for a paycheck. The team was under pressure to deliver a rewrite of the flagship product after having been handed an agressive delivery date. In spite of the Scrum board and other information radiators in their area, the Scrum Master had to deliver progress reports to the CEO every day. The company president and vice presidents attended sprint reviews and grilled the team whenever a story was not closed or sprint goal not met. One could easily argue that a fixed scope and fixed delivery date is in no way agile – end of discussion – but this still happens in organizations that use (at least partially) agile practices leaving Scrum Masters to navigate choppy waters. Of course the team developed some coping mechanisms, the most insidious of which was kicking the can down the road. Whenever the team encountered unexpected complexity or scenarios when working on a story, they said “this wasn’t in the story that we planned, so let’s call the current story done so that our sprint metrics will look good and handle the extra stuff sometime later.” Everyone except for the Scrum Master was happy – for awhile. Team velocities looked good. Stories were being closed as planned. On the surface it looked like features were being completed. The teams were going to deliver on schedule. The Scrum Master knew deep down that they were either going to deliver late or deliver an application with enormous amounts of technical debt. She also knew that the organization could not handle to truth so she soldiered on. Then the bubble burst. The collective “oh crap” moment happened when people realized that the system should be production-ready but was not. Some features were incomplete. Bugs were still there from parallel testing that had been performed months ago. There was no room in the time before the expected completion date to resolve all of the open issues. Market launch would be delayed. The ‘shadow backlog’ existed in the developers’ minds and in the list of open defects that were logged elsewhere from ongoing user testing. There were no product backlog items for them and no sprints in the release plan for addressing them. – Make sure that all remaining work is visible. Create backlog items for stories, technical debt, and bugs. The backlog consists of Product Backlog Items (PBIs), not just user stories. – Get user feedback during the sprint to avoid surprises later. Ideally users are integrated into the process via acceptance test driven development (ATDD). At a minimum they have an opportunity to see stories in action and provide feedback in the sprint. Any feedback and new ideas that cannot be incorporated during the sprint should be captured as real backlog items and sized/prioritized. – Don’t be afraid to keep a story open if it was more difficult or took longer than expected when sprint planning was originally done. Better to take a little heat now rather than have the bubble burst later. – Avoid ‘bucket stories’ near the end of a release that become a dumping ground for stuff that did not get completed in the sprints. Bucket stories can quickly grow exponentially and delay the release. 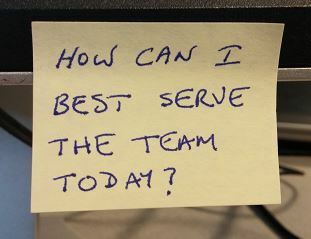 As a Product Owner, I start each day by asking myself, “How can I best serve the team today?” The PO and Scrum Master’s roles as servant leaders is not news. The challenge for the PO is translating this mindset into actions. It is all about mastering the cadence of product ownership. Attend daily standups. Every day. Help the Scrum Master resolve certain blocking issues for the current sprint. Meet with team members to answer questions about stories in the current sprint. Prepare for the next backlog grooming meeting. Revisit backlog prioritization, identify which stories will be groomed, add Acceptance Tests/Criteria or other information to the stories. Consult with end users or business stakeholders where appropriate. Facilitate backlog grooming meetings with the team. Receive demos of or perform testing for stories as they are completed as part of the sprint. This is typically part of the team’s Definition of Done. Meet with clients/stakeholders/users to discuss and define future product plans. Participate in the team retrospective. Prepare for the next sprint planning meeting by revisiting backlog priorities and assessing progress against the Release Plan. This is a long list of responsibilities. Note the choice of words. They are not just tasks or meetings – they are key responsibilities that must be fulfilled in order for the team to function properly. A calendar for scheduling meetings and recurring events. Of course this includes daily meetings, weekly backlog grooming meetings and other ceremonies. I also schedule time to sit down by myself to prep for the next grooming meeting or to prep for the next sprint planning meeting. In doing so I am much more likely to actually do these rather than to forget about them or push them aside when a lot of other things pop up. A personal Kanban board (I use Trello) to keep up with requests that are made of me. This could include questions from stakeholders/users/clients, information requests from developers, research items, or any other tasks that I need to take care of. I find that a Kanban board helps with prioritization. It also helps with tracking items that are in progress, such as when I need to request information from users to make a priority or feature decision for the developers. Some of these activities cannot be done in one setting so tracking them on the Kanban board helps prevent them from falling through the cracks. Limiting personal work in progress can help avoid task saturation and the mistakes that ensue. The Product Owner must understand and develop a cadence for fulfilling their responsibilities. Operating in a haphazard manner hurts them and the team. Managing personal work in progress helps reduce mistakes and the number of things that fall through the cracks. No personal organization system is perfect, so I also make it very clear to the Scrum Master and the team to call me out whenever I have fallen short on fulfilling my responsibilities. I am there to serve them, after all.